Elsevier's R&D solutions are a portfolio of tools that bring together incomparable data assets, powerful analytics and technologies to help R&D professionals, engineers and researchers invent and commercialise ideas, products and processes. 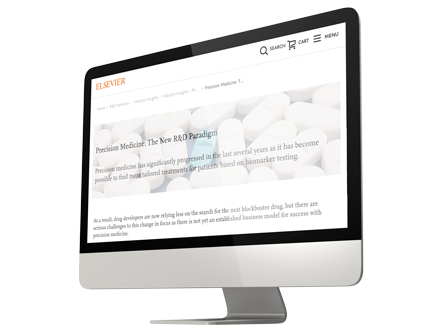 Make better pharmaceutical drug discovery & development decisions, from target identification to pre-clinical to postmarket surveillance. Successfully develop, improve and commercialise compounds, while efficiently managing costs and achieving environment, health and safety (EHS) goals. Stay ahead of competition and at the forefront of technology, while managing costs, regulations and health and safety risks. Empower students, faculty and researchers with data and technology to acquire essential skills and accomplish groundbreaking research. Drug makers are turning their focus from developing blockbuster drugs to making advances in precision medicine treatments. But what will they need to do to succeed? Embase increases the discovery of biomedical evidence to support critical life sciences functions, delivering relevant, up-to-date biomedical information to the global research community. Geofacets is a geoscience technology solution that enables efficient and thorough analysis of subsurface geology to empower confident natural resource exploration decisions and research. Pathway Studio facilitates the interpretation of experimental data, giving greater insight into the mechanisms of disease and accelerating biological research. PharmaPendium provides the comparative and up-to-date information needed to verify pharmacokinetic and experimental data, anticipate species-specific issues in translating in vitro and in vivo studies, and predict potential drug–drug interactions, and design clinical trial studies to comply with regulatory requirements. QUOSA reduces time spent monitoring, managing, organising and annotating scientific and medical literature for triage and compliance reports such as PSURs and ICSRs. ScienceDirect, Elsevier’s leading information solution for researchers, enables pharmaceutical and life sciences researchers to more effectively and efficiently search authoritative, full-text scientific, technical and health content through the use of smart, intuitive functionality. Scopus helps pharmaceutical and life sciences researchers to detect trends, find research partnerships and identify key opinion leaders with the world’s largest abstract and citation database of peer-reviewed literature, complete with tools to track, analyse and visualise scholarly research.